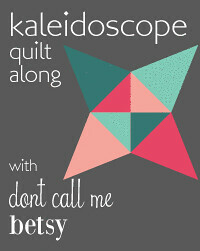 I hadn't forgotten about this quilt along, life has just been a tad bit hectic lately! I bought this bundle from Pink Castle Fabrics, this bundle was actually intended for another quilt along, but once I saw all the lovely purples, I just couldn't resist and thought it would be perfect for the Kaleidoscope Quilt Along. This bundle came with two yellows, that I ended up removing, and instead added in a few fat quarters from the lovely line, The Blue Skies by Sharon Holland Designs, which I felt blended in perfectly. I will be using the light gray solid as the background print, and can't wait to get to cutting! YUM! Oh, that's a lovely grouping, Marci! Can't wait to see it progress. I am loving your fabric choices! can't wait to see your blocks. Very pretty choices, I can't wait to see how it all comes together. Those are lovely fabrics, your quilt will be wonderful!